willow, originally uploaded by jahansell. 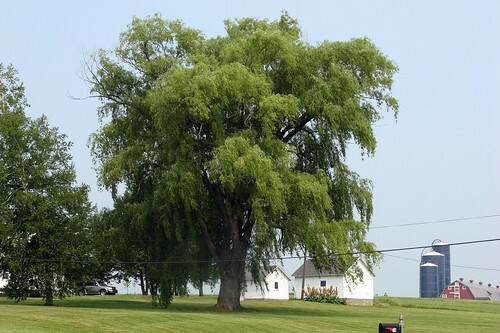 Still on our way to Millerton down Sharon Station Road.... a stop to admire this immense and elegant willow tree. Another interesting tree note - no picture yet, but I'll work on it: there's an organization here promoting a species of Elm that is resistent to Dutch Elm disease. When I was a kid my street was lined with graceful, arching elms - but they all died off -- in fact in this enlightening blog post, there's a photo of a Detroit street, before and after the disease struck. (Not my block, but perhaps close!) So this group, Elm Watch, which is based here, is promoting a disease-resistant strain of elms, which Home Depot now stocks. I'll get you a picture of one, ASAP, with more of the tale - it will be our arrival in Millerton. Those were beautiful trees, Dutch Elm. I am interested in the replacement variety and had no idea Home Depot stocked them. The birds planted a Green Ash here a few years ago and I am trying to keep it going but the ash borer is in the area so I know it will not last long. Sad days ahead. As far as willows go, we had two that I planted and they grew into giants. In 1981 when I had my office built I wanted to remove one as it seemed too close to the new room addition. When we cut into it the entire center was gone, eaten away by carpenter ants. They we suspected the other and it was the same so they were both cut down and the wood used up. They were also very dirty trees. We had a pond then and it was always filled with things from one or both willows. Still, that has nothing to do with your photography. Which is very nice indeed. I really like to know more about your country, I like your blog. I am from Holland and I like photography too. Feel free to visit my blog, I would like that. We had the same problem here with Dutch Elm disease...so sad to see the mighty trees that had withstood so much that weather threw at them finally succumbing and being felled. I do love Weeping Willows; they have such a beautiful form. Nice pic, and I loved reading about the elm diusease and seeing those contrasting pics in Detroit on the link you provided. I wrote your name wrong as "Sharon" Sorry, I was mistaken anyway I like your blog, also the others.